In days long past, the Crawling Queen, a creature of the abyss, lorded over the lands of man, elf and dwarf. Here reign was terrible and the lamentations of the suffering people carried into the heavens! In time a dwarven prophet, St. Canor came to their aid. Leading a bold group of heroes, he overcame the Queen and bound her in a temple. He set the bodies of his fallen comrades to guard her and placed wards upon them to imprison her. Over their tombs and her cell he built a great temple. There she lay for many eons. But time passes and all things decay. So it was with the temple. Falling into the ruins came a host of her minions who threatened to break the wards and bring the Crawling Queen back to power. Such a horror must be prevented. But the dangers are far greater than the Temple, for in her tomb beneath the ruins lie horrors unimagined and dangers to pry the skin from mortal men's flesh. Deeper still lie the dungeons where the darkness is complete and the horror long buried resurfaces. All this and much more await those willing to accept the challenges offered in The Curse of the Khan. 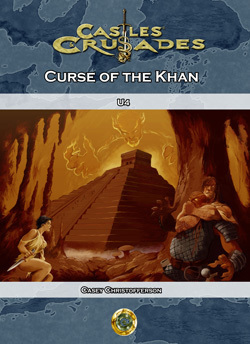 The Curse of the Khan combines fast paced action with challenging role play and mind boggling puzzles at every turn. Including four brand new monsters and a plethora of new magical items, The Curse of the Khan is designed to keep your players on their toes, providing hours of dungeon crawling, mind mangling fun!